Often students ask me how to start a personal home yoga practice. It is easy to dismiss this question as silly. Surely the aspirant just gets on the mat and practises the poses that they know. But students and teachers alike know that it is not so easy. It took me five years to establish my own personal practice. It was a struggle. There were many mental obstacles to overcome. For the first five years of my yoga learning I was, as Prashant Iyengar says, “a class goer” only. Initially I was going to two classes per week. After two years of classes, I began to contemplate the idea of home practice. This was solely and absolutely motivated by my ego. Other people in my class had started doing Sirsasana (headstand) in the middle of the room and I was the only remaining student firmly glued to the wall. I was embarrassed by this as I was not used to being ‘last’ in a class of anything. I resolved to practise at home. For those five years I had the intention of practising each morning. I made many attempts. I would set the alarm for a ridiculously early hour – 5 am, with the intention of practising for two hours before going to work. The alarm would go off (and wake my partner up), I would turn it off and then lie in bed thinking that I really should get up and practise, and what I could practise if did. Very soon it was 7am at which point I would get up and get ready for work. I wasted time, my partner was angry, I lost sleep and nothing was achieved. Yet I persisted, repeating this same scenario, often for a full week at a time. There were many perfectly good excuses. It was cold; I’d have to turn the heater on. I didn’t know where my yoga mat was. I’d had a late night. I was tired. I was feeling premenstrual. I deserved to rest. And so on the excuses went. On occasion, common sense and will prevailed; initially at least. I got up, dressed, found the yoga mat and set up in supta virasana (supine hero pose) over a bolster. I would stay in a sleepy fashion in the dark for 15 minutes or so, sit up to continue practice, only to then change my mind and convince myself that I really was too tired to practice after all, and promptly go back to bed. Time was wasted again and again. I devoted a lot of mental energy and time to self-flagellation. I was lazy. I squandered time. I was the sort of person who lets themselves down. Someone who sabotages their own best intentions. I was a ‘gunna’. I was gunna do this and that but, in fact, did nothing. Still I tried, and sometimes got further than supta virasana. I would do adho mukha virasana, uttanasana (standing forward bend) and adho mukha svanasana (dog pose). Then I would remember the words of my teacher, PL, stating “if after 15 minutes on your mat, you still really don’t want to be there, then stop”. Upon recalling these well-intentioned words, I would say to myself that I really didn’t want to be there anymore and give myself permission to return to bed! Occasionally, I would try practising after I came home from work. However, I needed to have a rest first, then a cup of tea, by which time it would be 6.30 or 7pm – time to cook and eat dinner. The mental obstacles and excuses continued. Eventually I realised that, to avoid self-sabotage, some forward planning was required. I needed to know what to practise. I started to read Light on Yoga (the seminal text from BKS Iyengar). I focussed on the introduction and then the appendices, within which three courses are given. At night, prior to going to bed, I would choose a sequence from Course One and keep the book open to the correct page ready for morning practice. I even got out my mat and props ready for the big practice. However, upon making it to the mat in the morning I realised that I only knew a few of the Sanskrit names of the asanas. This meant I kept having to flick through the book to the photographic plates to identify the asanas listed in the sequences. This took up a lot of time and I only managed to do 10 12 poses before running out of time. But it was a start. After a few weeks of these experiences, I resolved to complete one of the Light on Yoga Course One sequences every morning. To avoid wasting time because I didn’t know the names of the asanas, diligently I started to copy out the sequences by hand (no home computer or printer in those days) the night before. I would refer to the photographic plates and draw a matching stick figure beside the Sanskrit name of the pose. This way I would know what poses to do and not have to keep flipping through pages in the book. This method proved to be highly successful. Not only did I nearly complete each sequence (they get very long) but in taking this approach I very quickly learnt all of the Sanskrit names of the asanas. I would still sleep-in sometimes, but I had established a regular home practice a few times per week. It had taken me five years, but I had finally cracked it! The next year or so still involved many failed practice attempts. But I had more successes than I did failures. Of my early days in yoga being a ‘class goer’ only, I often said of my relationship with yoga that I was ‘flirting’ with yoga. 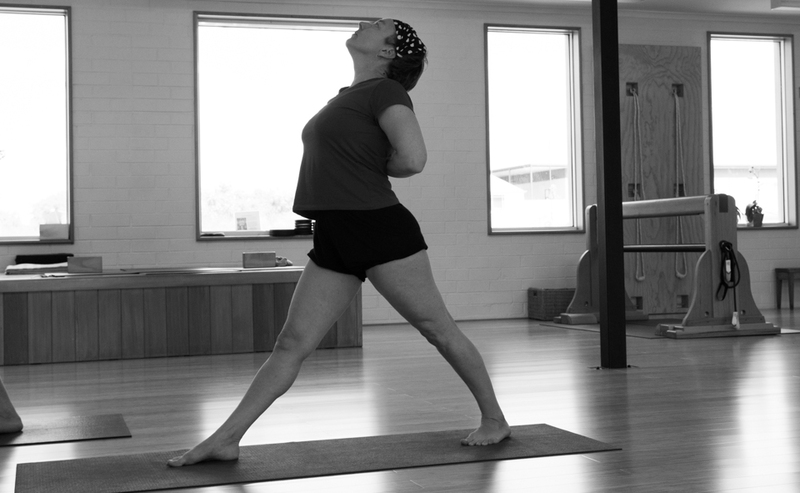 When I finally overcame the mental obstacles to personal practice, by writing out sequences and practising a couple of times per week (in addition to class going), I referred to myself and yoga as ‘being engaged’. Finally, because I was enjoying both practising and the rewards it brought (improved sleep, less volatile moods, firmer stronger legs, a sense of overall contentedness), I reduced my working hours to four days per week so I could attend another led practice with PL, as well as incorporate reading yoga texts as part of my yoga study. I was practising or going to class at least six days per week. I joked that it was the moment that I became married to yoga. The marriage has been tested many times with the arrival of children, work requirements and meeting the needs of extended family members. Finding the time to practise is eternally difficult. The only way to do this is to plan the time and days for a practise and to stick to it. I regularly say ‘no’ to requests from other people for me to do something, or ignore work that needs to be done, in order to preserve the time for practice. It doesn’t matter how long it takes you to establish your own personal practice – it might take years, it might be just a matter of months. But don’t give up. It is only when personal practice is truly established that real meaningful transformation of the self can take place. We begin to realise that yoga is not merely about exercise but it is a method to study ourselves, change ourselves and ultimately gain a sense of internal freedom.